Contrary to news report that Nollywood star actress and her man, Phillip Ehiagwina are still planning to hold their white wedding, authoritative sources hinted http://www.nollywoodgists.com that the ceremony had indeed taken place in Houston, United States of America last weekend! The Pre-wedding party and wedding proper took place on 27 and 28 of February 2009 respectively. At present, Ini is still having a swell time with her man in Houston as felicitations continue to pour for the newly married couple. Sources hinted that few friends of the Nollywood actress such as Oge Okoye an Emem Isong were at the event to support one of their own. 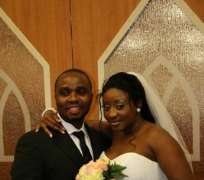 The wedding appears to be the final nail needed to seal their relationship, which went through turbulence over allegations and counter allegations of infidelity between Phillip and his ex-wife, Ruth Okoro.